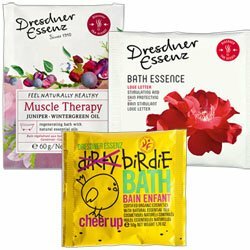 Dresdner Essenz Wellness Baths and Dirty Birdie | P.C. Fallon Co.
For over a century, Dresdner Essenz has offered beneficial health and wellness products to help achieve harmonious balance of mind, body and soul. Long popular in Europe where the company is based, these wonderful natural Baths are now being imported into the USA. Experience these remarkable Wellness Baths, each with its own unique blend of botanicals and aromatic ingredients. All Dresdner Essenz baths for adults and children are made in Germany.